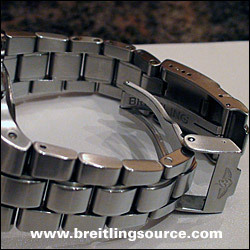 The Hercules bracelet is a completely unique bracelet that Breitling developed specifically for the Hercules watch, and does not appear on any other watch ever made by Breitling. The replacement for the Hercules model, the Skyracer, does not use the same bracelet, but reverts to the Professional II bracelet which is standard in the Professional Line. This bracelet is actually a 5 link bracelet, though it appears to only be a three link bracelet at first. The links are both brushed and polished, giving it a unique look not unlike the Omega Seamaster professional bracelets.